Designed specifically to collect, display and analyze data in physics and engineering labs. Try PASCO Capstone risk free for 60 days. Existing users can download the latest version. Capstone 1.13.2 released 4/23/2019. Purchase a licensed copy of PASCO Capstone. 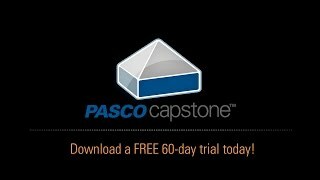 PASCO Capstone allows users to quickly layout custom pages, automatically recognizes sensors when connected, has a powerful set of analysis tools and much, much more. PASCO Capstone was built from the ground up to be the most powerful and flexible option for physics and engineering applications. Can be used with all current and legacy PASCO USB interfaces. Works with all PASCO sensors -- ScienceWorkshop, PASPORT, and Wireless. Opens DataStudio, Xplorer GLX and SPARKvue files. Available to Non-U.S. customers only. Install Capstone software all computers on a non-U.S. K-12 campus or in a college/university department. Install Capstone software all computers on a non-U.S. K-12 campus or in a college/university department. Digital download version only. Electronic delivery – download after purchase. Works with all PASCO sensors PASPORT, ScienceWorkshop, and Wireless. Made a mistake? Or two? Just hit the Undo button to back up. As students complete their lab assignment, they can capture aspects of their lab into the student journal for later assessment in their lab writeups. Other software still relies heavily on dialog boxes whereas Capstone has incorporated more modern UI design elements such as in-context options and display tools. We are constantly improving our user experience to eliminate barriers to usage and improve student learning. Features can be turned on/off so when an assignment is opened, the student only has access to the necessary tools for the assignment. Capstone’s signal generator controls allow for advanced settings to accommodate the demands of advanced circuits labs. 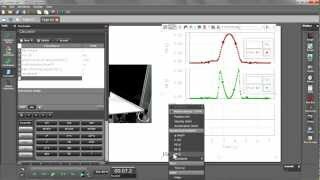 Waveforms: DC, Sine, Square, Triangle, Positive/Negative Ramp, Positive Square, Positive Up/Down Ramp. Capstone provides a display that behaves like a digital oscilloscope with tools specific to how oscilloscopes are used (trigger, single trace collection, sample rate tied to time axis scale, set trace offset). This is very different from other software that uses the same graph display for slow and faster sampling rates. A bar meter has one or more bars that go up and down as the measurement value changes. In this example, eight temperature sensors are distributed along a metal bar and one end is immersed in boiling water and the other is immersed in ice water. The eight bar meters show the temperatures along the metal bar as it reaches a dynamic equilibrium. With PASCO's new syncing technology, wireless sensors are automatically synced as soon as more than one is plugged in. If you desire to sync them more closely just before recording, you can click on the new sync button on the Sampling Control bar. Collect data using a mobile device running SPARKvue Software and then open the SPARKvue file in Capstone for more extensive analysis. When the new Smart Fan Accessory is plugged into a Smart Cart, you can control the Smart Fan directly from Capstone. Use the slider to set the thrust. Set the fan to turn on and off based on a measurement (such as Smart Cart Position) or time. Hands off: Start the fan remotely in the software. Use a calculation to define the thrust: Thrust = 10*[Force] will make the thrust proportional to the force exerted on a force sensor. Easy layout of workbook pages. Choose from a template and fill it with data. Create table columns with ease. Simply click a button to insert a column. Drag a display onto the page and other displays will move and resize to make room. Insert a calculated column and create the equation in the table. Click and drag dividers to resize and realign multiple displays at once. Insert equations easily. Equations created in a word processor can be copied into a text box. Manually Sample Data in Any Order. Click in any cell and the current value shows. Fill the cells in any order. If you revisit a cell to replace the reading, you can see both the previous value and the current value. Capture and Synch Video to Data. 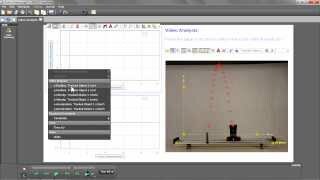 Track an object(s) in two dimensions and display the data in a graph or table. Rotate the coordinate axes to compensate for a camera that is not level. 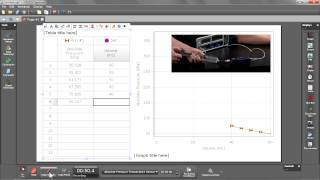 Make measurements of the length or diameter of objects. Move to Wireless. Students can record the sensor data and sent it to the computer via Bluetooth. The data is sent wirelessly to the desktop computer and displayed live with the video being recorded by the webcam. Snapshot workspace pages into the Journal and save them. Save as a set of .png pictures and an html file so you can view the journal pages with an Internet browser. Add annotations for each page. Sophisticated calculator. Type calculations using Greek symbols, subscripts and superscripts, making equations look more like they do in text books. Calibration Wizard. 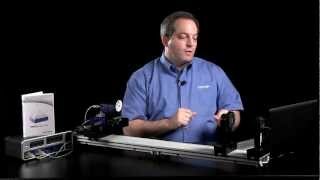 When needed, calibration of sensors is quick and easy. 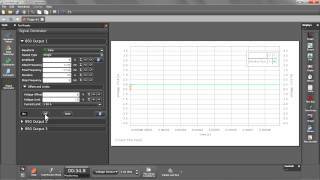 Photogate Timer Setup Wizard. The wizard takes you through the steps of creating a timer for the photogates, using graphics to make it clear which timing mode you are choosing. The histogram accumulates the number of values of a measurement that fall within bin ranges of your specification. It is useful for statistical experiments. Display multiple runs side-by-side, stacked or overlaid. Find Statistics such as the mean, root mean square, and most probable value. 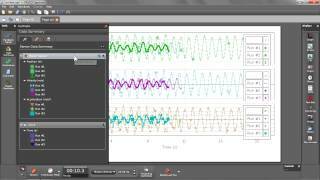 Export data to the graph for curve fit analysis. Title/Captions on Displays. Bold titles make it clear which measurement is being displayed. Graphs are labeled as figures and you can add a descriptive caption. 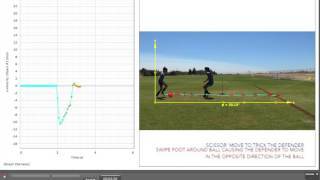 Perform FFT analysis and use the capability to zoom in for greater detail. As you zoom in on the FFT, initially the bins are large (in pink), but the software automatically adjusts the bins to give greater detail (in blue). Transparent plots. The data is painted in a transparent color, so multiple passes get progressively darker. Without this feature this graph would be solid purple with no detail showing. Visual Statistics. Statistics are displayed on the graph with lines at the maximum, minimum and mean. The standard deviation is shown as a shaded area. Control All Aspects of Function Generators. Whether it is the 550 or 850, our stand-alone function generator or even the discontinued 750 Interface, you can adjust all the settings independently. Exclude or Delete Data Points from Analysis. After highlighting the portions you want to remove the excluded points will be shown as gray X's and then ignored when you push auto-scale. User-defined Error Bars. Enter individual error values for each data point. You have the option to use unequal positive and negative error values. Copy Graphs and other Displays into Word Processing software or presentation software. PASCO Capstone supports all PASCO USB interfaces, including legacy interfaces. Bluetooth 4 support required for use with wireless sensors and Smart Carts. A Bluetooth adapter is available. Compatibility details.